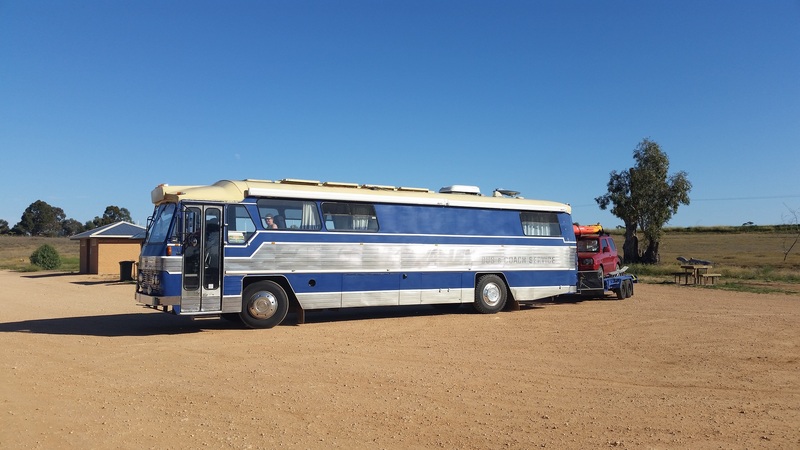 Buoyed by the success of rebuilding the tow bar and three successful house sitting travel Australia assignments we set off from Adelaide on our next gallivant with the wonderful and joyful feeling of a new adventure. 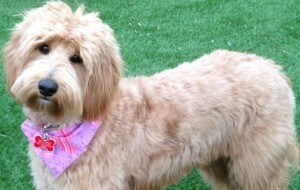 This was especially so this time, in that we were going to be farm sitting and for me, to fulfill a long held desire. 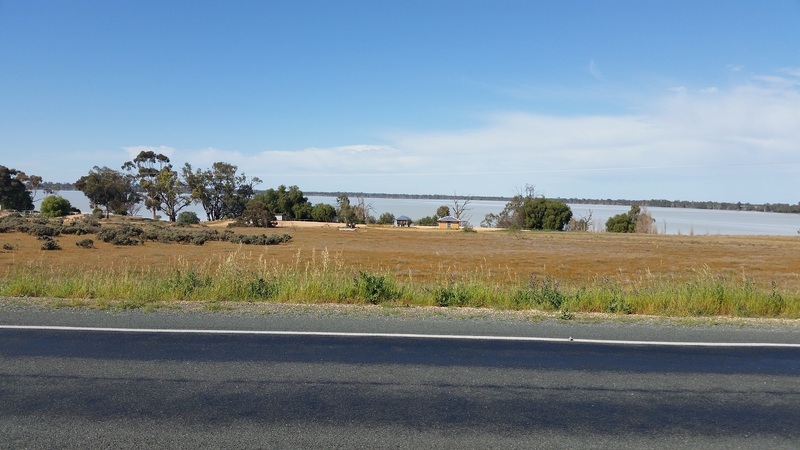 As we had already met Ian and Jo on the way down to Glenrowan and had been in touch while in Adelaide, we knew that the farm was all we could hope for and seven weeks of it to boot. It was only 1200 kilometres and we had eight days to get there so we knew we had plenty of time. We planned a leisurely maximum of 200 ks each day with maybe an extra day here or there. As usual we did not plan too carefully as this creates a schedule and spoils the fun. Actually that is not the reason, it’s a lot of work and it never works out so why bother? 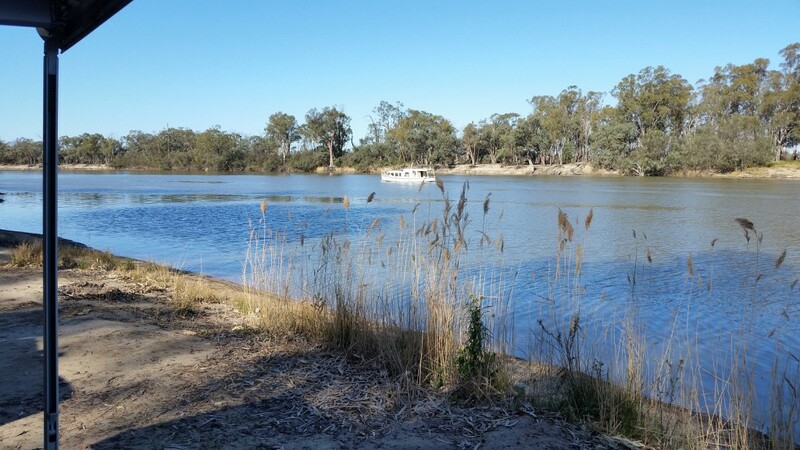 We had planned to catch up with friends in Renmark but they were on holidays in Thailand or Vietnam but having decided on that route we continued, finding a nice spot beside the Murray River for our first night. The house in Adelaide had no clothes drier so had a little chore to put up a line when we set up camp and I’ve no idea what the neighbours thought but isn’t that one of the few benefits of getting old, who cares? I think the people next to us thought themselves a bit of a cut above and clearly very proud of their caravan. They were friendly enough until about 9pm when they complained about the noise of our generator but perhaps is had something to do with our earlier conversation about their dog. When the lady asked me if I liked Labradoodles or whatever it was, I probably shouldn’t have said “of course, but I couldn’t eat a whole one”. We had about a dozen neighbours in the general area of the camp including one who looked as though they had been there quite a while. While I surveyed the possibilities in Kmart, Julie made some lunch although she was not feeling 100 percent. 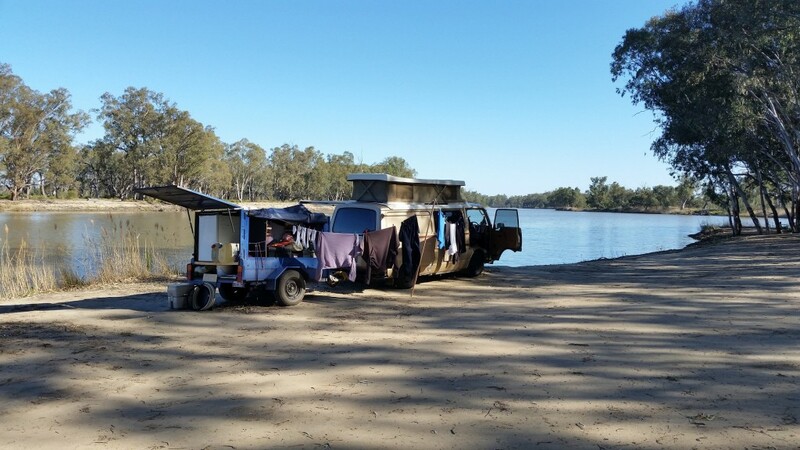 A few minutes later we crossed into New South Wales for the 100 kilometre run to a road-side camp next to Lake Benanee giving us easy access to the water and where I spent a while walking the ‘beach’. Late in the afternoon I received a mysterious phone call asking if I could identify myself. I assured the lady I could and I could vouch for me too if required, but apparently all she wanted to know was, if I wanted my wallet back. Charmaine (now there’s a handle to be proud of) worked at Kmart in Mildura and it seemed I had left my wallet at the checkout point where one goes to self-check purchases. This was my first attempt and it looks like I left it there of dropped it on the way out. Either way, it was completely intact, not that there was much cash but I was happy to know I didn’t have to get replacements for the rest of the contents. We decided that it was too far to go back, racking up another 200 kilometres, so I asked her to post it to our temporary address in Crookwell, when I found out what it was. With that little drama out the way and as the sun was setting, it was time for the traditional ‘sundowners’ so I trundled over to share a drink with the occupants of a bus parked across the way. This couple was totally at home, having sold up and gone on the road, moving short distances, staying a few days, seeing, feeling and living life, every precious moment. True ‘Grey Nomads’ I knew exactly how they felt. Julie joined us a little later for a chat and had a woman-to-woman sticky inside the bus. Buses are the subject of much debate in grey nomad land, weighing up the pros of space and total sufficiency in juxtaposition against the cons of fuel cost and the need for room to park. The following day turned out to be a long one, well longer than it could have been. The next town in an easterly direction is Balranald and the sixty five kilometres of scenery probably would not have inspired many landscape artists. Low trees and scrub is the main feature, followed at intervals by low trees and scrub so we were grateful to get into Balranald although it was a short reprieve before heading back out to see some more low trees and scrub. Leaving Balranald refreshed, we drove onto the Hay Plains. “What are the Hay Plains?” I hear you ask. Nothing is the answer. Miles and miles of the stuff, a hundred and thirty two kilometres of nothing, which is difficult to photograph, but I’ll try. The only thing on the horizon was nothing. Miles and miles of nothing. I haven’t seen so much nothing for a very long time. The link above will give you a second opinion however the blogger does appear to have a similar description. To his credit, he does point out one feature I had overlooked, it’s rather flat. 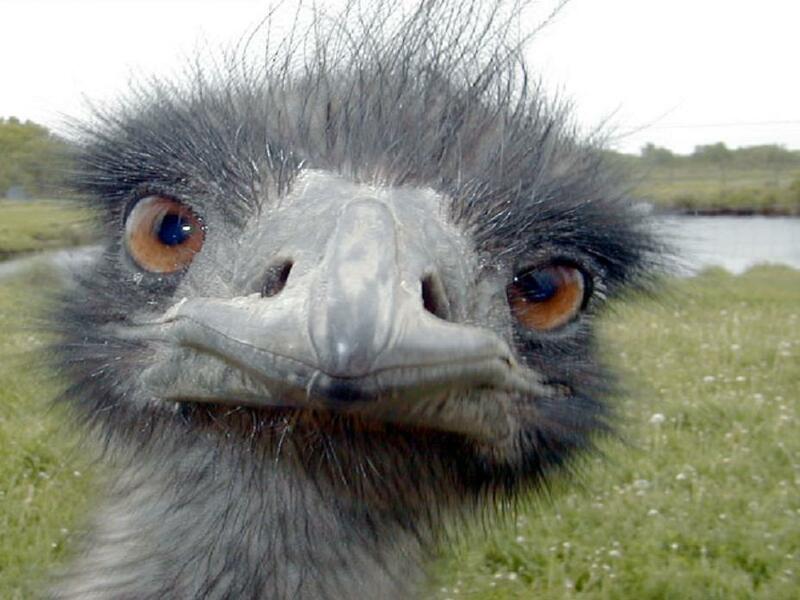 But wait, what do I see, an emu? And another? Bloody emus, they are hundreds of emus spread out in groups of threes and fours, blending into the background, almost impossible to make into a useable photograph, and that is just the ones we can see by the road. Presumably the density of emus is similar right across this scrub all the way to the horizon in all directions. I can’t imagine how many emus there must be out here. 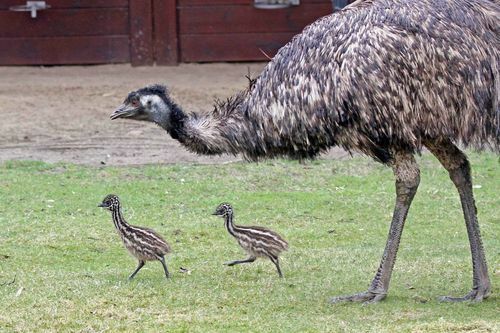 Fascinating creatures, emus, but by all accounts not as smart as a chicken, well the males anyway. It is one of the few species where mum does the business and then hands over the babes for dad to mind while she finds another bloke. I guess it’s good to see the girls get the upper hand for a change, which doesn’t happen much unless you are a spider or a praying mantis. Apparently they taste pretty good too, the emus I mean. Counting emus was the only game in town for quite a while but eventually we arrived in Hay. Well sort of, the Sturt Highway doesn’t actually go into the town but we got fuel and headed to what I hoped was our destination today, just a few k east of town. Did I mention marital friction? By now I was ready to hit the Hay in a manner of speaking, I just wanted to find a quite spot by the river and have a good lie down, but every spot we tried, according to the navigator, ‘was just not quite right’. Leaving Hay in our rear view mirror, the view improved as the scrub returned and in places was converted to farm land. Knowing the scenery was only going to improve the further east we travelled eased the discomfort of knowing I could be settled back with a beer beside the river right now. 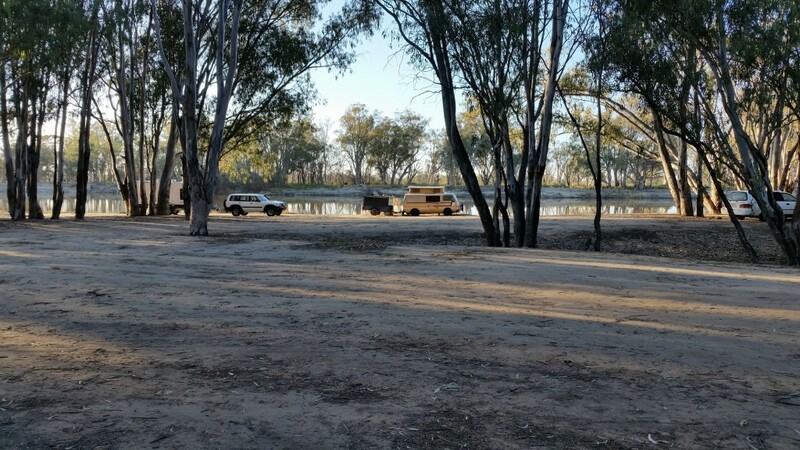 A mere 118 kilometres later, with eyes glazed over, we limped into Darlington Point by which time it was late in the day and certainly we both had had enough driving and discussion. This too was a series of camp sites on the same river but involved some careful negotiation of bush tracks to find somewhere suitable to set up for the night. At this point it’s my duty to say it was worth the extra long drive to find a camp site that was sooo much better. But I won’t. In the end, all was well of course and the only drawback being the scarcity of timber for the fire. Apparently we were not the first to camp on these sands. In fact there was hardly a scrap of movable wood in several hundred metres. I’m glad we didn’t have to share the fire wood with neighbours. The next group of visitors better remember to bring their own. We didn’t leave much. It seems a little incongruous to be checking email and taking calls in this type of setting but in no way does that erode the sensations and revival of memories evoked by free camping. The smell of the gum leaves, the crackle of the fire and the screeching of the large white cockatoos that live in the river gums are the same for us as there were for the first people to live here, no doubt for tens of thousands of years. 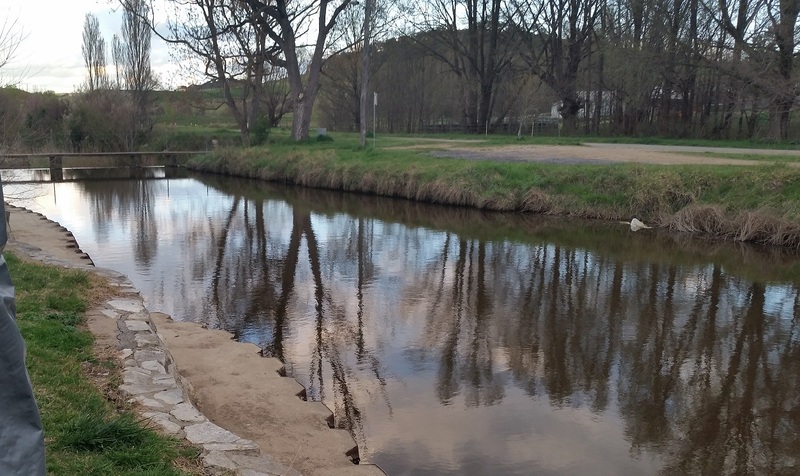 Across the river we could hear cattle and occasionally, to remind us of our proximity to the 1,000-strong patch of civilization, the distant buzz of a motor cycle. It was a peaceful end to a long day except for that mendacious information about the fish in the Murrumbidgee. The next morning we broke camp fairly early, well for us anyway and with the extra milage piled on yesterday, we were ahead of what passes for a schedule. 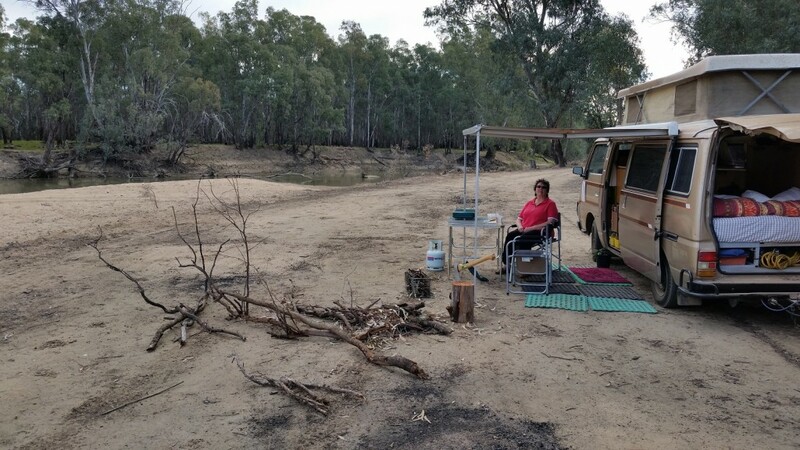 We were just dawdling along when we came to Narrandera where we took the opportunity to pick up fresh bread rolls and Julie cooked up some lunch at a beautiful little spot by the river while I fiddled with the engine. I am pleased that I was not aware at the time of the dreadful and disgraceful outcome for the traditional owners of the area upon settlement, ravaged by disease and clashes, the population was wiped out. In the mid to late afternoon, we arrived in Wagga Wagga which is another 150 ks to the east. We spent some time looking for fuel that did not require a bank loan but eventually, after a quick visit to the shops, we took up residence on the road-side camp on the northern side of town, joining a dozen others who were in the process of setting up or who had already been here a day or two. In terms of free camping, toilets are the main priority of course, followed in order of desirability, cold showers (not that we ever take them) and even more unlikely, hot showers. Wagga was no disappointment and as the weather was closing in, we decided to hunker down for a day of rest. Our hot shower system only needs a significant saucepan of hot water emptied into a large plastic bucket of moderating cold water to provide a satisfying experience. While the shower room is not completely warm of course, it does serve to keep out the breeze and the outcome is warm clothes and a sit by the fire or watch TV depending on circumstances. It’s very cosy and not at all uncomfortable so we were happy to sit out the rain on the following day and spend our time in leisure pursuits. The weather and the huge expanse of ground did not promote socializing but that was no issue for us, happy with our own company. Wednesday morning the 17th of September 2014 dawned partially overcast but clearing as we packed up and hit the road for our last stop, Gunning, a small town 220 kilometres east and where we stopped for a quick reconnoitre and morning tea a few months earlier. Fifty kilometres on we joined the M1 the freeway between Sydney and Melbourne so from here on it was a game of ‘catch a truck’. When you have a little engine and big load, standard speeds around the 100 kph are only possible downhill. If you happen to be on a freeway of course, the game changes, providing one can tuck in behind a truck, limited as they are to 100, it suits perfectly. We hitched a ride behind a Double B and cruised along at 100 all the way to Yass where we pulled off to get fuel. The area is such a pleasant change from the dry Hay Plains, but maybe it just looks good by comparison. Then it was back to ‘catchatruck’ until we turned off the freeway at Gunning where we picked a good spot by the creek. 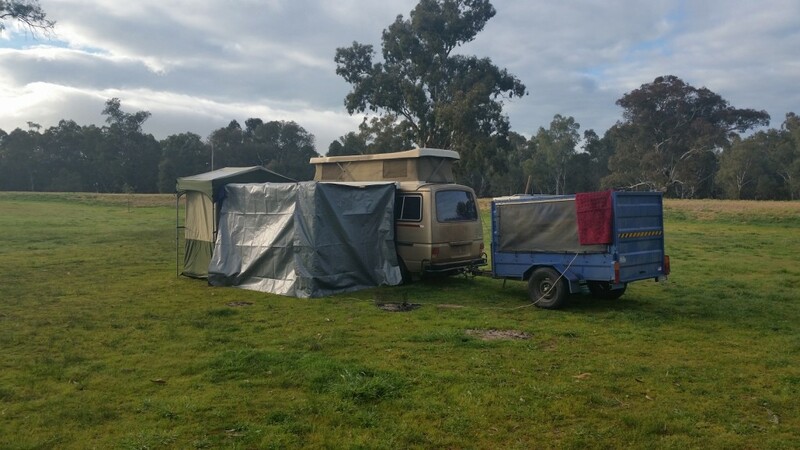 This is one of those rare camps where the local council provides travellers with free hot showers and so one needs to be early to be sure of a good spot, and by that I mean as level as possible not the site with the best view. We were happy to find both and appreciated the facilities and the town. We were not in a hurry the next morning as we had barely 45 kilometres to reach Crookwell, our new home for the next 7 weeks. 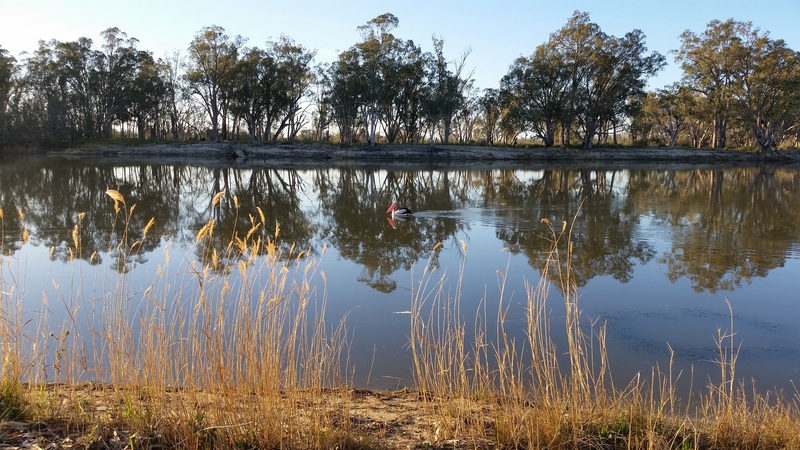 The country was changing rapidly now, especially as a contrast with the desert-like appearance of the Mildura Hay plains and the green rolling hills promised a couple of months of interesting things to do.